The traditional German Christmas recipes make delicious holiday cakes brimming with Old World goodness. Coming as they do from Pennsylvania German kitchens, they are worth the little extra time it takes to make them from scratch. These festive Christmas cakes are so good tasting and so special in their appearance that your Holiday baking will receive rave reviews and requests for second helpings. Don't say I didn't warn you! Enjoy the old fashioned Lebkuchen topped with icing that's pictured above. The homemade almond cake is traditionally served Christmas morning, also the sweet little "Belsnickel" Christmas cakes, and the crispy cinnamon wafers that eat more like Christmas cookies than cake. 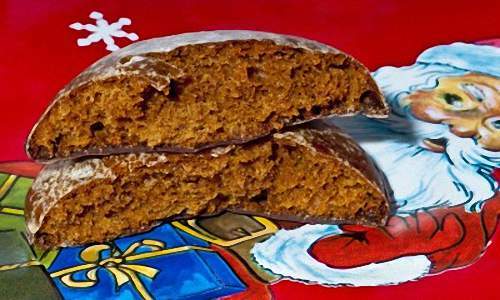 Lebkuchen are small, traditional German cakes that somewhat resemble soft gingerbread. 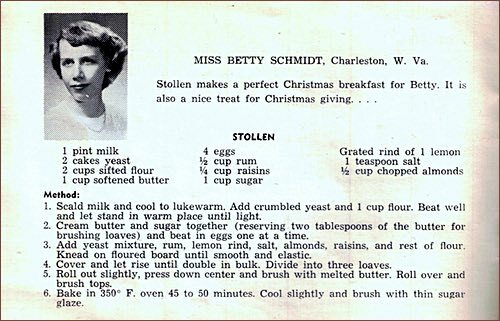 This is one of the old German Christmas recipes from which Aunt Sarah's mother always baked. 1/4 pound citron finely shaved on a "slaw-cutter"
Boil 2 cups of sugar and 1/2 cup of water seven minutes. Pour over the stiffly beaten whites of three eggs; ice the cakes. 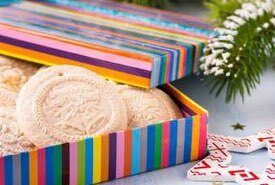 Place cakes in a tin box when icing has become cold and these will keep quite a long time. I have eaten high-priced, imported Lebkuchen no better than those made from this recipe. Set to rise early in the morning. To the scalded milk, when lukewarm, add the yeast and flour enough to make a batter, cover, set to rise until light, near the range, which will take several hours. Then add the sugar, butter and eggs beaten to a cream, grated rind and juice of orange, a couple tablespoons finely chopped almonds, and add enough flour to make a soft dough, as stiff as can be stirred with a spoon; set to rise again, and when light, divide the dough in two portions, from which you form two wreaths. Roll half the dough in three long strips on the floured bake-board with the hands, then braid them together. Place a large coffee cup or bowl inverted on the center of a large, round or oval, well-greased pan, lay the wreath around the bowl. The bowl in the center of the pan prevents the dough from running together and forming a cake. Brush the top of the wreath with a little milk, containing teaspoon of sugar; over the top of the wreath, stick blanched, well-dried almonds, and strew thickly with crushed rock candy or very coarse sugar. Let rise until light, then bake. This makes two quite large wreaths. The Professor's wife, Frau Schmidt, told Mary when she gave her this recipe, this almond wreath was always served at the breakfast table on Christmas morning at the home of her parents in Germany, and was always baked by her mother, who gave her this German Christmas recipe, and it was found on the breakfast table of Frau Schmidt Christmas morning just as regularly. Beat to a cream sugar, butter, and yolks of eggs. Then add milk and flour alternately and fruit and almonds. Lastly, add stiffly beaten whites of eggs. Flour fruit before adding. Chop figs. Cut citron fine or shave it thin. This is a cheaper German Christmas recipe to make than the one for "Christmas fruit cake," but this is a very good cake. Cream together in a bowl half a pound of pulverized sugar and half a pound of butter; then add yolks of five eggs, 1 grated lemon rind, 1 pint of milk, 1-1/2 pounds of flour sifted with 4 teaspoonfuls of baking powder, 2 teaspoonfuls of vanilla extract. Bake at once in a moderately hot oven. Mary baked an ordinary-sized cake by using one-half of this recipe. 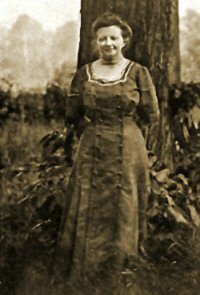 The cake was fine grained, similar to a pound cake, although not quite as rich, and she added a couple tablespoonfuls of thinly shaved citron to the batter before baking. This is a particularly fine cake. Bake 2-1/2 to 3 hours. This is an excellent cake. Belsnickel is the fur-clad Santa Claus traditional in parts of Germany. Mix in just enough flour so the cake dough may be rolled out quite thin on a floured board, using as little flour as possible. Cut out small cakes and bake lightly in a moderately hot oven. The butter, when melted, should fill one cup; pour it over the two cups of sugar in a bowl and beat until smooth and creamy; add the eggs, beating one at a time into the mixture. Sift the teaspoonful of baking soda several times through the flour before adding to the cake mixture. Stand this dough in a cold place one hour at least before cutting out cakes. No flavoring is used. Sift granulated sugar thickly over cakes before placing them in oven to bake. From these ingredients were made over one hundred cakes. One-half this German Christmas recipe might be used for a small family. The cakes keep well in a dry, cool place. This old Belsnickel recipe of Aunt Sarah's mother derived its name "Belsnickel" from the fact that the Belsnickels, who invariably visited the houses of "Bucks County" farmers on Christmas Eve, were always treated to some of these delicious little Christmas cakes. Mix like ordinary cake. Divide this into three parts. Flavor one part with vanilla, 1 with chocolate, and the other with cinnamon. These latter will be darker than the first. Place a piece of dough as large as a marble in a small hot, well-greased waffle or wafer iron. Press two sides of iron together, which flattens out cake, and hold by a long handle over fire, turning it over occasionally until cakes are baked. The cake, when baked, is a delicious, thin, rich wafer, about the size of half a common soda cracker. I have never eaten these Christmas cakes at any place excepting at Aunt Sarah's. The wafer iron she possessed was brought by her Grandmother from Germany. The waffle or wafer irons might be obtained in this country. 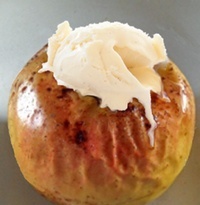 Baked apples are a traditional German dessert served on Saint Nicholas Day, December 6th. The "Bratapfel" is a symbol of generosity and the bags of coins that Nikolaos of Myra gave to the poor in the 4th century. 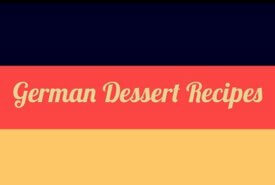 This German Christmas recipe makes a baked apple dessert that's most popular around Christmas time, but it's also served and enjoyed throughout the winter season as a delicious comfort food when the weather is cool. It's the perfect dessert to enjoy while warm and cozy in front of the fireplace after a busy day. First, carefully core 2 firm, tart apples, but don't core all the way through to the bottom. A small spoon will work if you don't have a corer. Leave the bottom 1/4 of the apple intact to prevent the filling from leaking out. Mix the ingredients together, then stuff apples with this mixture. A little rum can be poured into the buttered baking dish, if desired. Bake in preheated oven until apples are soft or begin to split (30 to 45 minutes at 425°F). Serve warm from the oven topped with a dollap of raspberry jam with whipped cream, or vanilla ice cream. Lightly sprinkle with cinnamon. 1. Scald milk and cool to lukewarm. Add crumbled yeast and 1 cup flour. Beat well and let stand in warm place until light. 2. Cream butter and sugar together (reserving two tablespoons of the butter for brushing loaves) and beat in eggs one at a time. 3. Add yeast mixture, rum, lemon rind, salt, almonds, raisins, and rest of the flour. Knead on floured board until smooth and elastic. 4. Cover and let rise until double in bulk. Divide into three loaves. 5. Roll out slightly, press down center and brush with melted butter. Roll over and brush tops. 6. Bake in 350°F oven 45 to 50 minutes. Cool slightly and brush with thin sugar glaze. Mix 1/2 pound butter with 1/2 pound powdered sugar, add yolks 6 eggs, and 3/4 pound of flour. Beat the sugar and butter before adding eggs, well beaten separately, and then the flour and a spoonful of vanilla. Roll out and form into cakes the shape of an S or a U, cover with an icing of sugar and water boiled, adding currants and candied peel, if desired. Bake in a very hot oven until done. Chop 1/2 pound of sweet and 1/2 ounce of bitter almonds. Add 1/2 pound of sugar, and boil to a paste. Knead it well, roll thin and cut into squares. When these are dry, dip them in fancy icing, and use for dessert.